“Where the hell is Kotor?” I admit I had literally never heard of Kotor before looking up the itinerary of this Celebrity Cruise. The coastal town in Montenegro along the Adriatic Sea has become a popular cruise stop for good reason. You can see the city in a day, and it has maintained it’s charm despite being 100% dedicated to tourism (more on that later). I considered this own of the top pleasant surprises of our entire trip. 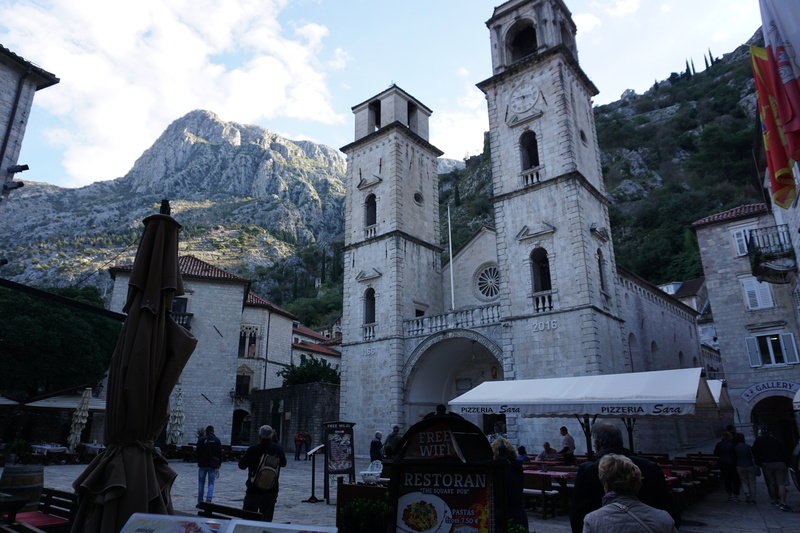 A review of Kotor is a review of Montenegro. The very small country has only been independent from Serbia since 2006, and had been previously conquered by a dozen countries. From Illyrian to Byzantine to Independent Kingdom to Venetian to Napoleonic France to Yugoslavia to Serbia to Independence. He noted several times they managed to never be conquered by the Ottomans, seemingly a point of pride. It became quite clear by 10 minutes in that Vampas would have preferred if the region had remained as Yugoslavia. From the end of WW2 through Tito’s death in the early 1980’s, the united republics under communist rule were an industrial juggernaut. The shells of a five star hotel and a waterfront manufacturing plant back his claim. When sanctions were enacted in the 90s, everything crumbled. The unemployment rate which had been 0 soared, leading to a rise in crime and corruption. It wasn’t until 2006, when the country became independent and jumped on the tourism bandwagon that it began to recover. For the past 10 years, tourism has been the country’s only industry. While in other countries an emphasis on tourism feels cheap and exploitative, I would say Kotor escapes that negative feeling. They are appreciative for your presence without aggressively pushing for your business. Instead of fetishizing a “village” lifestyle, you are there to appreciate 2,500 years of history. The Old Town of Kotor in genuine and intact with the exception of several portions which were rebuilt after the earthquake of 1667 and 1979. The residence of the Venetian Prince who once oversaw the city bleeds right into the theater that was built for Napolean. Orthodox churches represent the 80% of the population who are Orthodox Christians and a Catholic Cathedral serves the rest. 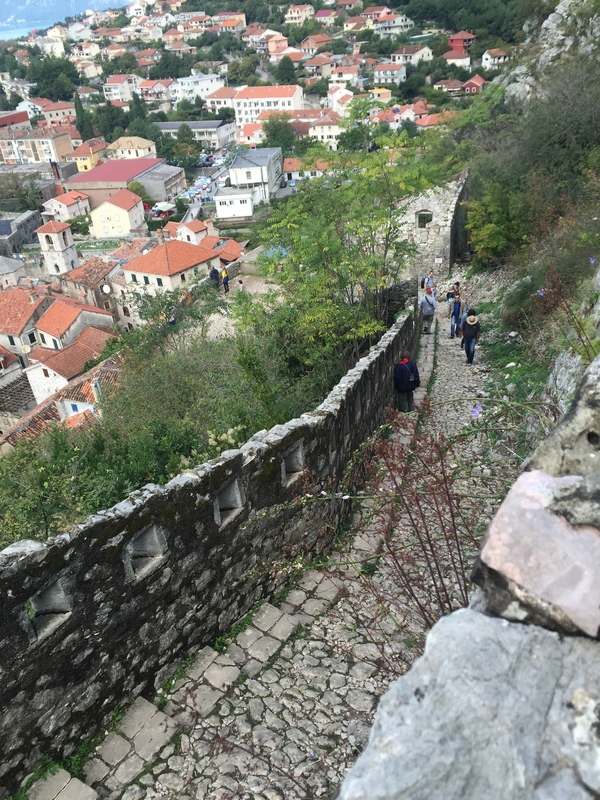 And on a funny side note that my husband looked up on his own – Montenegro is one of the only two countries using the Euro illegally. Not able or willing to make their own currency, they had been borrowing the German Mark. When it changed to Euro, they simply decided to start using it. The EU protested, pointing out that they weren’t a part of the EU. But Montenegro pointed out that their entrance into the union was inevitable, so why go through the hassle to coming up with their own currency? Not knowing what to do with this pesky, little brother of a country, they decided to let it do. So Kotor uses the Euro. Within every medieval building was either a restaurant, a boutique hotel, a clothing boutique or a souvenir shop. The centuries-old town 100% caters to tourists. The shop employees seemed to be all stylish young women. They look bored, but are happy to help if asked, and won’t be pushy – which I much appreciated. A .50 Euro public bathroom is located on a side street and identified on tourist maps. If you’d like to take home some of the country’s signature red Vranac wine, your guide can point you to a small grocery tucked among the tourist spots and you can get a bottle for 7 Euros. 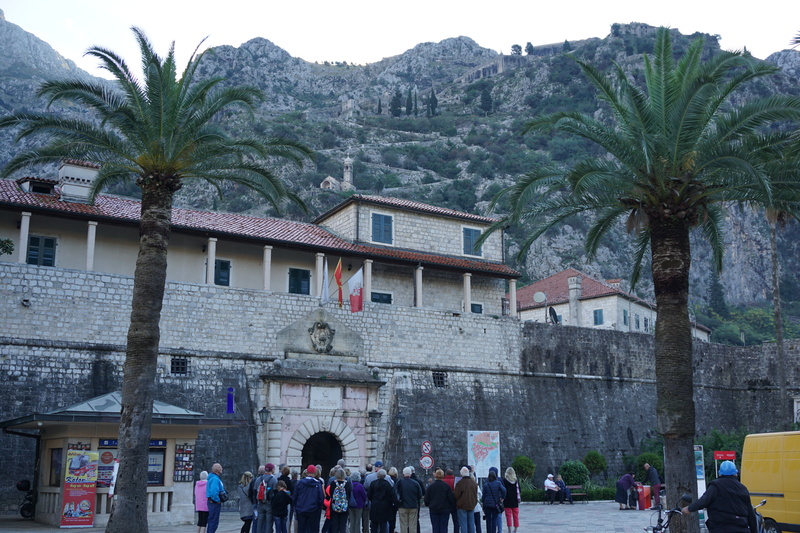 Kotor’s tower city walls surround the town and climb up the mountain like a mini Great Wall of China. It is 3 Euros to walk up the walls, so have a few coins with you. The stairs are narrow, but are accompanied by a ramp of precarious rocks. The first stop, about 20 minutes up, is a very small church/chapel (and accompanying stand of cheesy souvenirs). This is where most tourists (and I) stopped. The views are stunning, seeing the small medieval down, the fjord-like mountains and the cruise ship in the bay. My husband spent another 20 minutes to get to the top fort, which gives you a view of the other side of the mountain. You do not NEED a tour guide for any of this, as cruise ships leave their passengers just outside the city walls. But a walking tour may be informative and/or entertaining.